Reviva Labs Light Skin Peel. Not really a peel-peel. This lovely, cooling, lavender and herb scented stuff scrubs with natural exfoliators and real flowers. After scrubbing, I let it play masque. I leave it on until it dries then rinse and my skin feels renewed. I especially love this during our nasty-hot Arizona summers. OZ Naturals Ancient Orient Bamboo Enzyme Dermafoliant an update to the rice powder product, shown here and in updated packaging. This is amaze! When my face needs a hella scrub down, I reach for this. A little powder in the palm of my hand, add a little water and get to it. Exuviance Triple Microdermabrasion Face Polish. Combine a creamy base, physical skin polishing crystals, Papaya Enzyme and Glycolic Acid and you get a combination scrub/masque that makes me glow, baby, glow! This stuff is spendy, I won't lie. It's also worth every dime. Serious Skin Care Clycolic Gommage Extreme Renewal. Another combo of scrubby bits and Glycolic Acid that deeply cleanses, sweeps away loose, dead skin cells and leaves silken, glowing skin in it's wake. If you want more on my thoughts on this incredible stuff, see my Instagram review, here. Lather Chia Seed and Passion Fruit Exfoliating Gel. You know how much I love me some Lather and this cleanser is no exception. When I want a fresh clean and a gentle buff up, this is my go-to. If you are very sensitive but want effective cleansing and a smoother complexion, I recommend this stuff, wholeheartedly. Vanilla & Argan Lip Scrub. Yeah. Yeah. I know. I have Sugar Plum. But that was a LE flavor and is not available but the Vanilla and Argon is the same difference. A lovely, lip nourishing base and fine sugar gently, yet effectively polish away dry, flaky lip skin and leaves my pout feeling pillowy soft. This scrub is effective yet it is gentle enough that it doesn't irritate my annoyingly sensitive lips. We must, we must, we must, we must increase our bust exfoliate our bods! Whether I'm prepping for a fakealoo tan or just want to refresh and renew my skin and feel soft, all over I reach for a good scrub. Lather Lavender & Olive Foaming Body Scrub is a spa day in my shower. I reserve this for days when I want to pamper myself. A little goes a long way, I've used this quite a few times and I still have a ton left! This lavender and olive scented scrub lathers up as it's worked into my skin then rinses away clean to leave me happy, soft and relaxed. Farmhouse Fresh Sweet Tea Whipped Body Scrub. Sweet. Really does smell like tea. Deeply exfoliates and rinses away clean to leave my skin soft as soft can be and ready to receive any moisturizer or body butter I want to use. I especially like this scrub for my hands. As I get older, regular exfoliation and deep hydration are required to keep my hands looking and feeling their very best. Soap & Glory Flake Away Body Polish. I'm not exaggerating when I say that I buy tub after tub after tub of this stuff. Fine and coarse sea salt, light, natural oils and that fabulous Original Pink Fragrance. Follow up with The Righteous Butter and I feel like a whole new woman. Soft, delicately yet lastingly scented and so girly. The best part of all of these body scrubs? They don't leave my shower a slippery hazard zone. As usual, when using any softening and hydrating product in the shower, I make sure to step with care. Me, nekkid, wet, no bra, surrounded by paramedics? Not my dream scenario. So, there ya go. 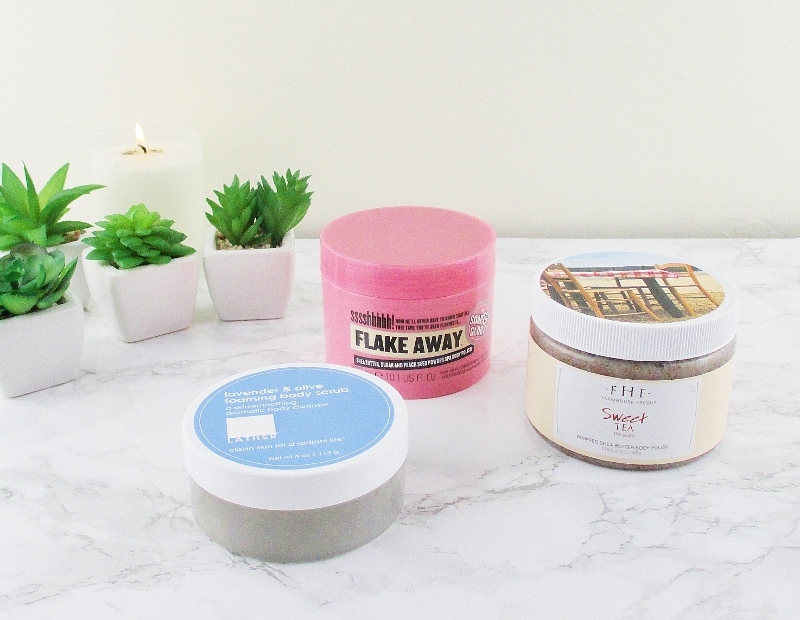 Some of my favorite, tried and true face, lip and body scrubs. They never fail and I can't, won't live without them. What are some of your favorite scrubs? Got any good ones that I should be using? Drop me some suggestions, in the comments section. So many gorgeous scrubs that I need!!!!!!!! Derma e, FHF and Reviva Labs make amazing scrubs! I need to try Soap & Glory! The Soap & Glory is wonderful! If you like a fresh, lightly floral scent and a good but not skin killer scrub, I think that you'd like it. I love the Derma E also! Reviva has such good products, I need to revisit them! I need to pick up another jar of the Reviva Light Skin Peel, soon. I'm almost out. I think I've used up four? Jars of that stuff. It's just so good. Vanilla & Argan Lip Scrub sounds great! LATHER makes my favorite lip scrubs. I love the Exuviance Triple Microdermabrasion exfoliator, and I just got a new body scrub from Farmhouse Fresh that I plan to use later today. Love all the scrubs! I was supposed to receive that scrub... Wonder if mine got hung up? 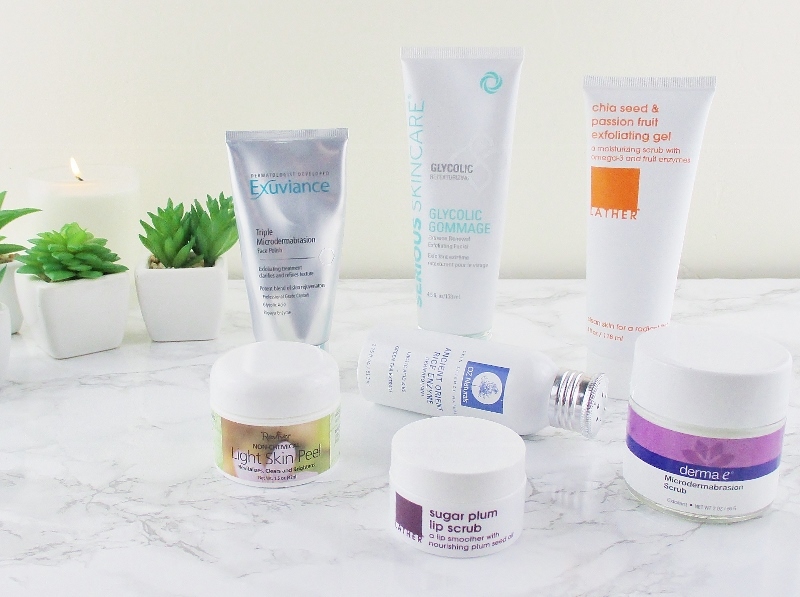 That Exuviance scrub/masque is life! Oooh lots of great picks here. I've tried the Derma-E, Exuvience and Reviva Labs and love them all. Those are some of my top choices. The Exuviance is amazing. My fav scrub is a coffee scrub from LEH soap company, it's a local small business. It exfoliates AND reduces my Redness from Rosacea! That scrub sounds wonderful, I love coffee scrubs. That lip scrub looks fantastic, love seeing your picks for this round. I love using Glycolic Gommage as a mask for 4-5 minutes, and then gently massaging it off with plenty of water. And Flake Away is a staple in my bath. You can't beat Soap & Glory for b&b products! Sadly all my Reviva Lab products are expired. When I'm off my no buy I'm due for a small haul. And the Farmhouse Fresh is a new scent to me. I bet it smells delish. Oh my gosh, these all sound wonderful! I can't believe that I've only tried the Flake Away one from your list. I'll be looking for a few more when I need to restock my collection. I'd love to try the Derma-E one. I love Flake Away, the scent is amazing! I also really like the Reviva Labs Light Skin Peel!! I love the scent of Flake Away and also really like The Light Skin Peel, thanks for reminding me about it! I've only heard good things about the Soap & Glory Body Scrub! I love good scrubs! I haven't used any of these, but I'll add some of these to my never ending wishlist! Fabulous picks, girl! 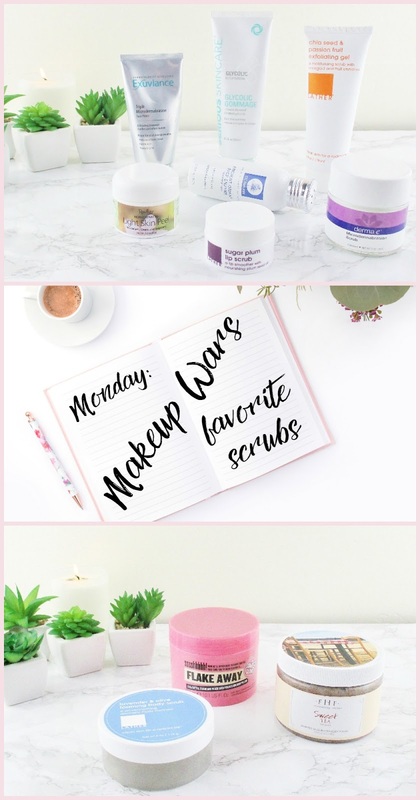 I rarely use scrubs these days and mostly rely on chemical exfoliation, but I treat myself to a nice all-over coffee or sugar scrub once in a while. It feels so good! I think I need some Farmhouse Fresh. I see nothing but good things about this brand. Don't tell anyone, but I am guilty of not body exfoliating enough....cuz I just don't know what to use that will be good....and unlike the face, I'm not willing to buy 25 things to find the right one. I kind of want one of everything, but the Lather options sound especially good. Oh no, I got so excited for that lip scrub...then read it was LE. Why are the best products LE :( I also adore Soap & Glory scrubs, they smell sooo good and now they're at Walgreens and Target. Score! You just got me to add a few scrubs to my "must try" list. I haven't tried any of these ones!